A few Fridays ago, after checking out an invitation maker, me and my now-married girl friend decided (mostly on my part because she's preggy, has mood swings and had me decided on a lot of things that day :P) to go to Trinoma to look for a ready-to-wear gown in Landmark (because the wedding was in a week, if anyone's wondering). Two in the afternoon, still haven't had lunch and wanted my friend to try gowns after she ate, I suggested we try Ramen X which I suddenly remembered reading from various sites. We don't usually go to Trinoma anymore (unlike when we were in college) and I was craving for Japanese food but didn't want to eat my usual fare. Ramen X welcomes you with modern Asian stylish interior in black, red and white colors with glass doors and mirrors. It also incorporated some wood elements that is very common in Japanese interior. A variety of Naruto songs were playing that I was singing along while waiting for our food. Being well-it and having a big menu on the wall that clearly presented each item added an inviting charm (and good for those who have poor eyesight like me :D). A long communal table in the middle is perfect to seat hungry barkadas or teammates. [caption id="attachment_1315" align="aligncenter" width="373"] "Ramen is the new soul food." "A ramen a days keeps the doctor away." My first time in a ramen place, it was hard for me to pick a ramen dish to try. Each has its own inviting elements that I wanted to sample all of them. I ended up choosing Shoyu Ramen, a soy-based roast pork noodles. It has chewy noodles, half an egg, cabbage, roasted pork, Naruto and green onions. At Ramen X, you can add toppings to spice up your ramen more. Choose from egg (1 whole @ P15.00 each), roasted pork (2 slices @ P30.00/serving), corn (P20.00/serving), green onions (P15.00/serving), or kimchi (P30.00/serving). I originally wanted to add corn in my ramen bowl but my love for kimchi won. Their kimchi is more spicy than what I usually eat from Mr. Kimbob, but the spiciness for me is bearable nonetheless. 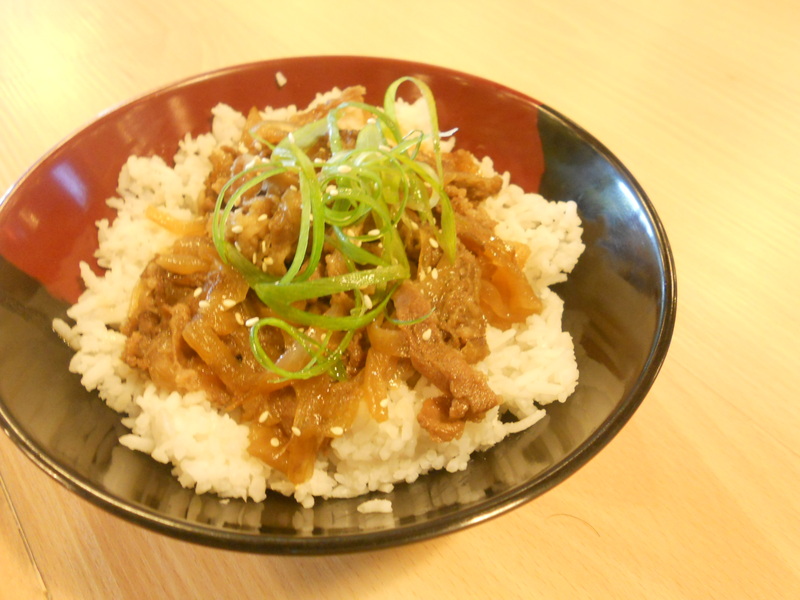 My friend on the other hand opted to eat Gyudon. She gave me around 2/3 of it (she doesn't eat much :/). Strips of marinated beef on top of hot steamed rice - it was sweet and savory, I feel in love with it too! Lots of choices for authentic Japanese food on a budget (especially their ramen). I hope they add sushi and maki though, since I was looking for those too. Being able to add additional toppings is a big plus for me. The service crew was very friendly and hospitable and is very attentive. Ramen is added to my list of comfort foods! I'd definitely go back here to try other ramen bowls and rice bowls! Mmmmm... I think I want to try this the next time we go Trinoma! That Gyudon and green apple soda look yummy! I wonder what the stuffing is of the fried gyoza. Those lil four worth 59? Unbelievable. I love ramen, but never been to ramen X. Love to sip on those hot soup. Oh yeah, now I am craving for some. Foods looks good. Might try Ramen X soon. Ramen X - Such a perfect meal for rainy weather days like today. Ramen X is indeed a place to visit. Perhaps they would also want to put up a tatami room where diners would have to sit on their legs while eating ramen. Just like in any typical Japanese restaurant. Yummy yum yum! I like ramen, just hoping they have a branch near me..
Ramen is perfect for rainy seasons just like this. Will definitely visit this place. Thanks for sharing. Will go there when I get the chance. That Shoyu Ramen is quite tempting. hmmp...really looks yummy and very affordable..